Jessica & Rob have a dream for their family: a year living on the road. 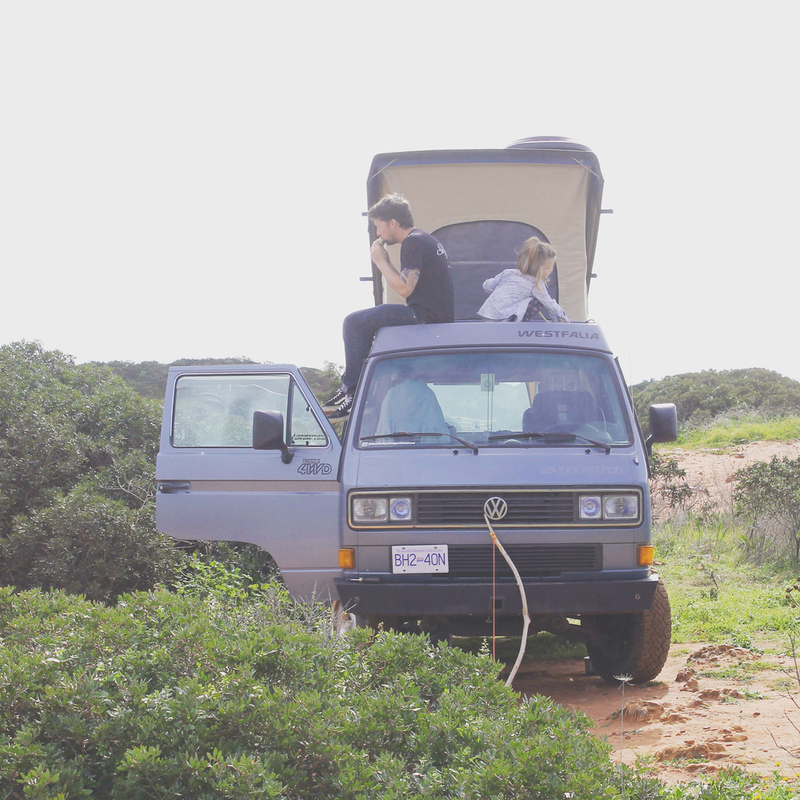 They long to see the humdrum of day-to-day life become fresh in the microcosm of their van and discover the world through the eyes of their daughter, Henley. But most of all, they want to slow down and live simply. Life in a van becomes a rhythm. With three people, every navigation inside becomes a choreographed dance move. It gives purpose and enjoyment to the most mundane tasks. Memories are made, for better and for worse. Jessica, Rob and Henley are discovering that life in the slow lane is an ongoing adventure and an exercise in savoring each day. Compared to many of the caravans and campers we see on the road, I believe we've got the best of both worlds: (most of) the comforts of home and also the blessing of anonymity (if we choose). Since we are relatively normal sized, we can navigate winding city streets with only minor domestic disputes and sprouted grey hairs, fit in regular parking spots and bypass most camping regulations due to the fact that if we choose not to pop the top or put on disco lights, we are relatively stealth. We have been traveling through Europe for the past six months and living in our van full-time. We had owned the van for two years before going on this trip. During that time, we not only saved up for this year abroad, but also went on a lot of amazing trips and learned how to use our van for the purpose it was designed. So far, we have traveled through England, Spain, Portugal, France, Hungary, Austria, Slovakia, Czech Republic and Germany, and still have quite a bit of continent to check off before we return to North America. We decided to come to Europe during the shoulder season, chiefly due to our desire to escape the suffocating crowds of tourist season. We are now psyching ourselves up to hit the colder climates of eastern Europe after a winter on the coasts. We plan to travel to Scotland, Wales, England and Belgium. We chose to ship our van over to Europe for many reasons, though the initial reaction from everyone we've met on the road is that we must be either flush for cash or batshit crazy (which is probably the case). The cost of shipping the vehicle out here was pocket change compared to the cost of renting one and much less of a hassle than buying one here and relying on an unfamiliar market to recoup our investment upon return. In the end, a minor upfront expense meant that we get to explore Europe in a vehicle/home that we already know and love. What were you doing before you went mobile? It was an exercise in playing a long game in the years leading up to this trip. We are happy to be homeowners (albeit tiny house homeowners) in our hometown of Squamish, British Columbia, where we are surrounded by beautiful wilderness and a community of like-minded young families. We have amazing friends and love where we live. We'd always experienced something akin to jealously (though I guess you could say admiration) when we would read stories of people who had made radical changes in pursuit of what could be perceived as wildly unconventional lifestyle choices, such as opening up a surf camp in Panama or traveling through South America in a VW van. And we decided the only difference between "them" and "us" was that they had just made it happen. So, we decided to make it happen. Rob worked as a carpenter long hours away from home and sacrificed time with his family to help expedite the process of getting us on the road. I stayed home with Henley and continued my work as an equestrian journalist. What was the process like to move into your mobile home? In the two years between our decision to hit the road and actually putting the van on a ship, there was so much time to mentally prepare and get excited that at times the waiting game was excruciating. We had to constantly remind ourselves to enjoy the present moments and not just look forward to the journey ahead. There were a few setbacks when the responsibilities of home ownership and life got in the way, so there were months where it felt like two steps forward and one step back. At times, the preparation was almost more mental than anything. It did, however, hugely influence our spending habits. We stopped shopping, cancelled our cable, rarely went out for food and said "no" to more social gatherings than I care to recall. There were periods where we definitely felt that we'd become slight hermits or social outcasts because we often declined invitations knowing that even just going out for a drink would set us back a day in Europe. We started to quantify money: if I buy this (first, do I really need to buy this? ), how many days in Europe will this replace? It was incredible to see how much money we were able to save each month by not going out for coffee and buying snacks here and there (I am a notorious snacker). When it came time to ship the van over, we had a garage sale to scale down our already fairly streamlined belongings and we stored the remainder of our most sentimental possessions in a storage unit. We're ready for a complete mind-blowing experience when we get home and realize that we've managed to survive happily without any of them. We rented out our house and completed mountainous forms of paperwork (which I make sound tedious but actually loved). We wanted to slow down. We wanted to discover the value of a life less ordinary. We wanted to get out of a routine that was making everything fly too quickly. This trip is so much more than a year's vacation for us. This is a hard-earned opportunity to make memories as a young family that we will forever cherish. We wanted to rediscover the pleasure of the simple things in life and help our daughter become adaptable and confident and learn to love the variety of the world and people in it. We want to have fun as a family in what is a most precious stage in life: the years before Henley is old enough to have to be forcibly coerced into spending time with us. We are fortunate that the grunt work was put in before we hit the road. Rob worked away from home and made a monumental sacrifice in spending so much time away from Henley in order to get us out here. He is taking this much-deserved time off to relax and enjoy life. I am keeping up with my freelance projects, as my work allows me the opportunity to be quite mobile. And though it means a considerable amount of deadline-induced anxiety around the first of every month, any little bit helps. After a short period of detox, it was interesting to discover that the world will continue to spin if I am not able to check my email 20 times a day. Though not one of the intended takeaways of this trip, being more unplugged has really opened my eyes to the amount that we used to lean on our phones and the Internet. What's it like living with a child on the road? Our decision to travel was motivated largely by our desire to spend time with our daughter before she is too old to have a say in whether or not she spends time with us. Our time with her leading up to this trip has been memorable in its own right and has certainly given us memories of life as a young family that we will forever cherish, but this trip was meant to slow everything down a bit. As does any four-year-old, Henley possesses an amazing sense of curiosity, enviable comedic timing and ability to observe the world around her with the delightful insights that only a child can manage. Hydration, a childlike sense of wonder and cool shades are absolute essentials of the veteran outdoor explorer. We do refresh days once a week, which means that we splurge on a campground with showers and Wi-Fi and live in the lap of luxury for 24 hours. It gives us an opportunity to recharge our batteries, do laundry, Skype with family back home and clean out the van. Cleaning the van is like being on a hamster wheel for me (which I love), but having a campsite allows us to spread our belongings out and scrub everything before putting it all back in and starting the week fresh. It is frowned upon if we perform this ritual in public spaces. It seems an exorbitant expense at times—though only a fraction the expense of a hotel room—but it has become a weekly routine that we look forward to. The Travellers Bookshelf: This has become one of the most anticipated experiences on our travels. As a print journalist, I wasn't quite willing to give into the eReader phenom and left home with only a spattering of crucial literature that I hoped would sustain us (which it did, for about two weeks). Through book exchanges found in the dusty and forgotten corners of campgrounds and corner stores, we've been fortunate to have a revolving door of books that have kept us all entertained. Wine: We've never really tried too hard to resist the siren song of the inexplicably cheap wine (often of the boxed variety). Returning to a reality where the cost of one bottle equals what we pay for a 5-liter box of local wine will be a challenge that I have not quite yet come to terms with. Coffee: Coffee is our lifeblood. We have an unspoken challenge every morning to see who will be the first to show weakness and go outside to turn on the kitchen gas. Rob is the early riser in our family, though my bladder sometimes betrays my quest for victory. This is a battle we have come to take more seriously as the temperatures have dropped on our voyage north. Baby Wipes: These are a guilty confession, as I recognize they are most probably filled with terrible chemicals masquerading as natural infusions and their impact on the landfills cannot be understated. But there has yet to be a messy, sticky child or situation that baby wipes have not saved me from upon the wings of angels. Heater: Our furnace, which runs off the propane that also runs our kitchen, is the best money we ever put into the van. With the flick of a switch, we are transported to a tropical paradise. This is absolutely priceless when getting out of cold wetsuits, coming out of the shower or getting out of bed in the morning. Dutch Oven: We cook every meal in our Dutch Oven. From breakfasts and one-pot wonders to fry-ups and meats, this integral tool in our kitchen arsenal continues to deliver delicious meals and minimal dishes come evening's end. Navigation System: Our GPS coined Shelley by Henley, has saved our marriage and helped us navigate through Europe. We tried using old school maps for the first two weeks and much back-patting and self-congratulatory celebration ensued. Then, we came to our senses. Running out of gas? Ask Shelley. Looking for a campsite? Ask Shelley. Park? Yup, Shelley. Bow down. What are your hobbies on and off the road? We partake in a fairly casual manner of all sort of outdoor activities, from surfing, snowboarding and hiking, to more serious outdoor pursuits like mushroom picking, boule, softball, lounging in the sun, picking berries and campfires at the river. I have spent my life around horses and Rob has spent his life in the mountains, so we have a mix of interests. But the outdoors is at the core. Henley loves to bike, and this trip has made her become an enthusiastic explorer. On the road, we take cribbage very seriously and our tournaments have drawn blood. Rob skateboards and many of our favorite camp spots have been at local skateparks. When we are having trouble finding a place to stay, we just seek out the hooligans and they have yet to let us down. We have developed the ability to turn playgrounds into an incredible (incredible to us, humorous for others, I'm sure) display of endurance and agility. With the help of programming from my weightlifting coach in Squamish, it is on these playgrounds that we aspire to squelch our need to be removed from Europe via forklift due to our excessive indulgence in all things edible and drinkable. For so many reasons, our time in France has been the most memorable thus far. I have family from Brittany, so spending time in the ancestral homeland has been spectacularly rewarding on a personal level. But also the history and culture of the French is unmatched in my eyes. We both speak the language, and the ability to communicate cannot be undervalued when you are spending long periods of time in a country (though our particular brand of Canadian sarcasm, self-deprecation and dryness doesn't always translate as well as we'd like). I love how the French keep us on our toes—just when we think we've earned the right to consider ourselves assimilated in some way, they raise one eyebrow or pursue their lips and our dreams come crashing to reality. But when we make a joke in French and it hits the mark, do we ever feel on top of the world. In France, we fell in love with every small village we passed through. It was hard to leave them behind, but we always took comfort in knowing there was another one down the road. That being said, Portugal also holds a spot dear in our hearts but for entirely different reasons. Portugal is also authentic—small town living with charm and history and a population that was entirely welcoming and warm. But whereas in France we felt most at home because it wasn't entirely dissimilar to our lives (or, at least, how we imagine our lives), Portugal felt like home because it put us so far out of our comfort zone but still made us feel equally as comfortable. Henley, having zero issues with the Biebs being on heavy rotation on Portuguese radio stations. What has been the most rewarding thing about living small? Time. We spend almost every waking hour together and we are fortunate to have these moments when many don't. We also just love to travel; every day out here is a new adventure. For me, travel has always given a heightened appreciation for "home," and I love that renewed feeling of appreciation for what we have waiting for us in Squamish. Traveling in our home makes it difficult to stop over in some of the big cities we'd love to explore. It allows us the opportunity to meander winding country roads and small villages. But we experience something akin to separation anxiety whenever we leave the van in big cities, so we tend not to do it. The most crucial thing to understand is that this is just normal life, but on the road. We still struggle to be understanding and empathetic partners to each other, and patient parents to a toddler. We worry about money; we have bad days. What is your advice to families who want to live small or hit the road? I don't think the discovery of the value of simplicity and being present in life has to necessarily be achieved by living small. But the process of preparing to do so certainly illuminated some patterns which we had fallen into. Our goal was never to eschew all our possessions and live a life of minimalist simplicity. But in our preparation, we did evaluate under a critical eye the aspects of our life that were lulling us into a cycle of consumerism and debt. We wanted to get debt-free (other than our mortgage), reduce the clutter in our home and brains and really evaluate what we chose to do with our lives. We evaluated what was important to us, what makes us happy and what we could change in our day-to-day lives that would allow us to live a more balanced lifestyle? It seems that most peoples' reactions to this trip have been, "wow, this is a trip of a lifetime for you guys," which is understandable, but far from captures the enormity of the impact this life on the road has had on us. We don't want this to be a trip of a lifetime; we want this to be a springboard to a lifestyle that brings us an enormous amount of happiness. We hope that traveling together will continue to enrich our lives moving forward. I am also developing a camping cookbook of the tried-and-true recipes inspired by the countries we visit while on the road. One of the things we learned early on in the buildup to our life on the road was that camping recipes—though a devilish treat in limited servings—are not necessarily conducive to maintaining a healthy lifestyle (or body type). This, in addition to the fact that I consider bacon to be wholly overrated and entirely too messy to counter its limited benefits, quickly necessitated that I adapt our everyday meals to suit our new life. Camping and food brings people together, and the preparation of food while we've been on the road has been some of our most memorable moments. We are eating our way through Europe and I am taking notes. All photos credit to the Here Today Vanagon Tomorrow. If you make a purchase using the link above, I may receive a small commission at no cost to you. This blog is a self-funded passion project, and working with brands help me keep the blog running and the stories coming. I only partner with brands that I believe in and ones that I have built a relationship with. Mountain Standard is one of them.